Astronomers from KU Leuven, Belgium, have shown that the interaction between the surface and the atmosphere of an exoplanet has major consequences for the temperature on the planet. This temperature, in turn, is a crucial element in the quest for habitable planets outside our Solar System. In the quest for habitable planets outside our Solar System astronomers are currently focusing on rocky planets of M dwarfs – stars that are smaller than our Sun. In our universe, there are many more M dwarfs than there are sun-like stars, making it more likely that astronomers will discover the first habitable exoplanet. Most planets orbiting these M dwarfs always face their star with the same side. As a result, they have permanent day and night sides. The day side is too hot to make life possible, while the night side is too cold. 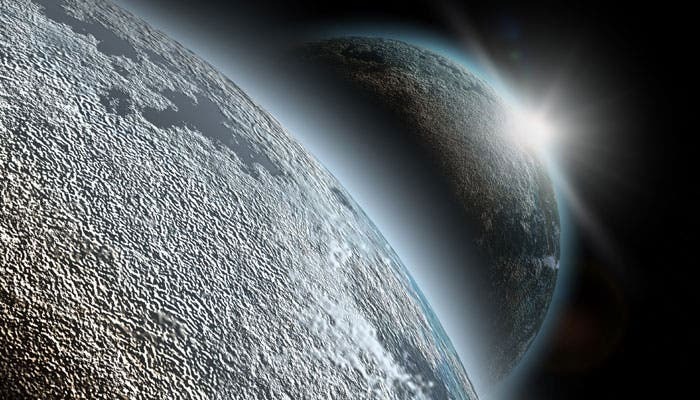 Last year, KU Leuven researchers showed that planets with permanent day sides may still be habitable depending on their ‘air conditioning’ system. Two out of three possible ‘air conditioning’ systems on these exoplanets use the cold air of the night side to cool down the day side. And with the right atmosphere and temperature, planets with permanent day and night sides are potentially habitable. Whether the ‘air conditioning’ system is actually effective depends on the interaction between the surface of the planet and its atmosphere. 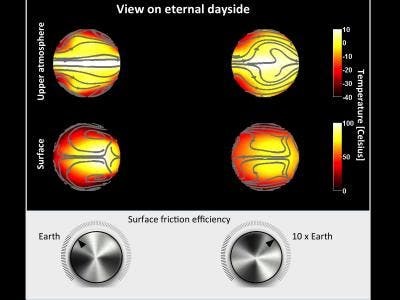 The graphic above shows the wind, temperature, and surface-atmosphere friction on a planet 1.45 times the size of the Earth in a 1-day orbit around an M dwarf. The two topmost figures show the wind and the temperature in the upper layers of the atmosphere. The two figures in the middle show the wind and the temperature on the surface of the planet. On the left-hand figures, the surface-atmosphere friction equals that on Earth. On the right-hand figures, there is ten times as much friction between surface and atmosphere than is the case on Earth. Both scenarios have a different impact on the climate of a planet: the climate represented in the right-hand figures is more habitable.